Demo of the MSK 012 transistor envelope generator, and my experimental hypercube-walking aleatoric melody generation technique. 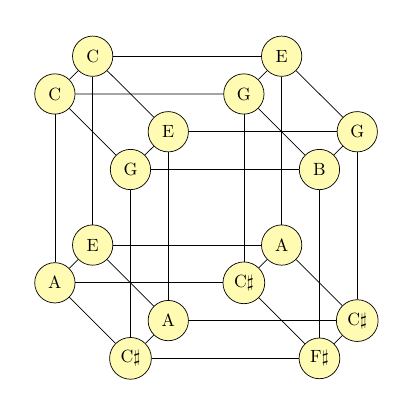 Four voices move around the graph at different speeds, playing the notes they hit, while the graph itself changes (among different cycle covers of the hypercube) occasionally too. Four voices, a little bit of processing, and all the automated generation in a single three-row Eurorack synth. The graph theory is done by my custom C code running on a Linux-based programmable module. Two voices are Z3000 oscillators, one is a North Coast Synthesis Ltd. MSK 007 Leapfrog VCF running as a sine-wave oscillator, and one is a Hikari Sine; then various combinations of the oscillators go through Erica Polivoks and Intellijel Dr. Octature II filters. Envelopes, mixing, and octave switching all by the appropriate North Coast modules, and there's also a Mutable Clouds in there for some background atmosphere. Pay particular attention to the way the melody changes, from just a repeating sequence at the start to more and more complexity as the graph-switching algorithm kicks it into larger and larger cycles; but always maintaining not only a key but a certain kind of idiom that is set by the unchanging hypercube framework.